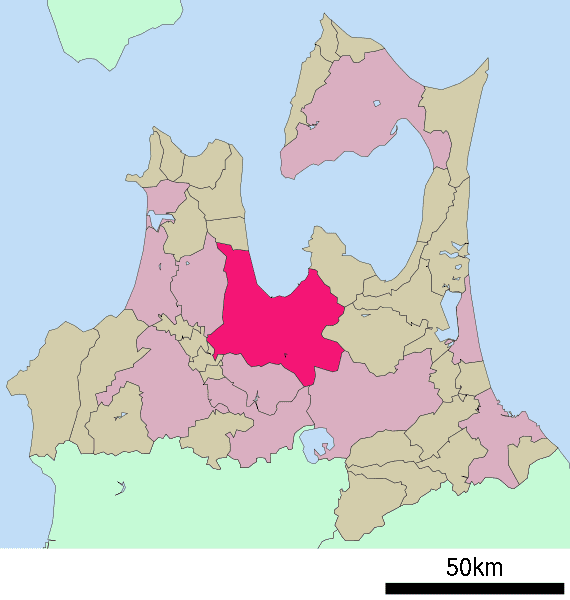 Aomori (青森市, Aomori-shi) is the capital city of Aomori Prefecture, in the northern Tōhoku region of northern Japan. As of September 2015, the city had an estimated population of 288,029, and a population density of 349 persons per km2. The total area of the city is 824.61 square kilometres (318.38 sq mi). The area has been settled extensively since prehistoric times, and numerous Jōmon period sites have been found by archaeologists, the most famous being the Sannai-Maruyama Ruins located just southwest of the city center dating to 5500-4000 BC, and the Komakino site slightly further south dating to around 4000 BC. The large scale of these settlements revolutionized theories on Jōmon period civilization. During the Heian period, the area was part of the holdings of the Northern Fujiwara clan, but remained inhabited by the Emishi people well into the historic period. After the fall of the Northern Fujiwara in the Kamakura period, the territory was part of the domain assigned to the Nambu clan, and into the Sengoku period, it came under the control of the rival Tsugaru clan, whose main castle was located in Namioka. After the start of the Edo period, Aomori was a minor port settlement for Hirosaki Domain called Utō (善知鳥村, Utō-mura). The town was rebuilt in 1626 by Moriyama Yashichirō, under orders of the daimyō, Tsugaru Nobuhira and renamed Aomori, but the name did not come into common use until after 1783. After the Meiji Restoration, the various domains were abolished and replaced with prefectures, a total of six in the territory of modern Aomori Prefecture. These were merged into the short-lived Hirosaki Prefecture in July 1871. However, due to the historic enmity between the former Tsugaru territories in the west and the former Nambu territories in the east, the prefectural capital relocated from Hirosaki to the more centrally-located Aomori immediately after the merger and the prefecture was renamed Aomori Prefecture on September 23, 1871. 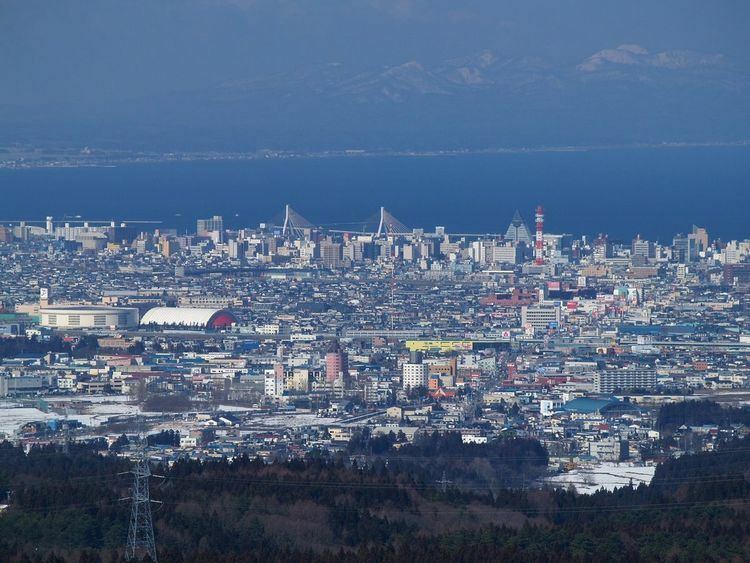 However, Aomori was not given town status within Higashitsugaru District until April 1, 1889, and was not designated a city until April 1, 1898. Like most of Tōhoku, Aomori has a humid temperate climate with warm summers, and cold, though not extreme, winters. The city has a humid continental climate (Köppen Dfa), with monthly averages ranging from −1.2 °C (29.8 °F) in January to 23.3 °C (73.9 °F) in August. Aomori Airport - (established in 1964 with international flights from 1995) is about a 35-minute drive from the city center, with a bus service available. There are daily flights to Tokyo, Osaka, Nagoya and Sapporo. There are also flights to Seoul, South Korea three times per week. Port of Aomori - The Seikan Ferry operates ferries to Hakodate. It takes about four hours to go by ferry from Aomori to Hakodate. The ferry was initially run by the Ministry of Railroads but was later taken over by Japanese National Railways. From 1908 to 1988 the ferry served as the primary transport between the island of Honshū and the northern island of Hokkaido. In March 1988, the Seikan Tunnel opened up, travelling under the Tsugaru Strait, this quickly replaced the slow-moving ferry as the primary transportation between the two islands. Aomori is the only prefectural capital in Japan which has no national university, instead, nearby Hirosaki became the site for the prefecture's highest educational facility. 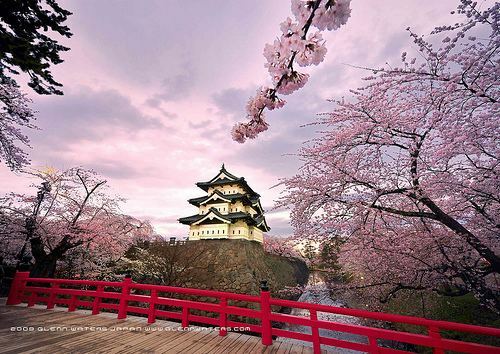 Hirosaki Castle is one of the most well-known sites in Aomori, and the best time to visit it is during the Cherry Blossom season (end of April and beginning of may in this site) when many tourists come to enjoy the cherry blossoms at the Hirosaki Sakura Festival in Hirosaki Park. Shirakami-Sanchi, Lake Towada, the Hakkoda Mountains and the Oirase Stream are other important locations in aomori to enjoy the nature. The Aomori Nebuta Festival is one of the main attractions, an amazing parade throughout the city with ornamented illuminated giant nebula floats. This festival is held every year from August 2 to August 7. If you can't make it in time for the festival, the Nebuta Warasse Museum, which is dedicated to the Nebuta Floats, is open all-year-round. Mt. Osore is one of Japan's 3 Great Sacred Grounds (the other two being Mt. Hiei and Mt. Koya) and because of that it is also one of the major sites in Aomori. Furofushi Onsen, an attractive open-air bathing house along the coast, the Aomori Museum of Art and the Sannai Maruyama site (the largest archeologial site from the Japanese Jomon Period) are also among the most important sites in Aomori. Aomori Nebuta is a famous festival performed from August 2–7 annually and is listed as one of the 100 Soundscapes of Japan by the Japanese Ministry of the Environment. Aomori has hosted several international curling events, two in 2003 (including the Asian Winter Games), and the local women's "Team Aomori" was selected to represent Japan at the 2006 Winter Olympics in Turin, Italy  and at the 2010 Winter Olympics in Vancouver, British Columbia, Canada. From March 17–25, 2007, Aomori hosted the World Women's Curling Championships.